Professor Sami Vähämaa from the University of Vaasa has been appointed as the new editor of Liiketaloudellinen Aikakauskirja - The Finnish Journal of Business Economics. The Finnish Journal of Business Economics has been published since 1952. 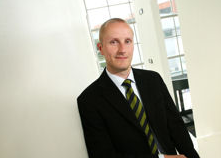 Professor Vähämaa has been a professor of accounting and finance in Vaasa University since 2006 and is also the director of the department of accounting and finance. He is a Docent at the Turku School of Economics and a Research Fellow at the German Kiel Institute for the World Economy. The Finnish Journal of Business Economics is a Finnish scientific journal, published by the Association of Business Schools Finland. ABS Finland is the cooperation platform of the different Finnish university business schools. ABS wishes that, with the leadership of Professor Vähämaa, The Finnish Journal of Business Economics will continue to develop in terms of quality of its content and also that the Journal will have in the future an increasingly international focus.